The art of engraving, which flourished in Europe as early as the Renaissance, first made its appearance in Greece in the 17th century. It was organized and set on a more systematic basis in the 19th century, when it provided elucidatory and illustrative material to accompany various forms of printed matter (books, periodicals and newspapers). And it emerged as an autonomous, diversified, creative art in the present century. Engraving is a demanding art, a combination of painting and sculpture which, in addition to artistic inspiration, calls for specialized knowledge and complete mastery of a wide variety of materials (wood, copper, stone, zinc, aluminium, steel, etc. ); discipline, precision, and an attention to minute detail in its many techniques (wood-engraving, copper-engraving, lithography, linocuts, silk-screen printing and mixed techniques); and an imaginative, inventive mind, able to realize its vast expressive potential and exploit the continually evolving dynamic of its numerous applications in the visual arts. In the beginning, Greek engraving produced prints of a religious nature, that served ecclesiastical policy, followed later by patriotic works, portraying personalities and events of the Greek War of Independence. Gradually, however, from the first half of the 19th century, prints were made depicting secular subjects, which henceforth formed the major part of its repertoire. 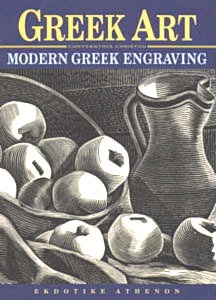 The volume "Modern Greek Engraving" begins with a presentation of the techniques involved in engraving and a discussion of the thorny problem of the authenticity of prints, and continues with a brief review of the history of engraving, with special reference to the major European engravers. There follows a detailed account of the history of the art from Greece, from its first appearance in the 17th century until the present day, with special emphasis on the great masters and creators of the 19th and mainly of the 20th century.